14 th October 2010 Added the Science & Discovery Day photos & report. 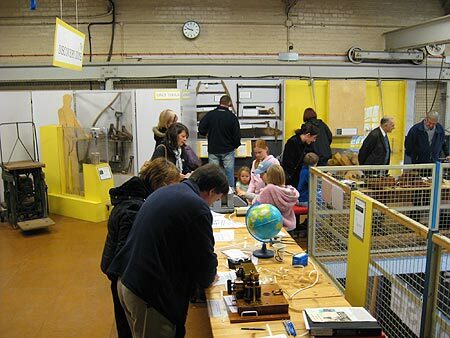 The Chelmsford Science & Industry Museum at Sandford Mill have a series of Open Sundays each year. 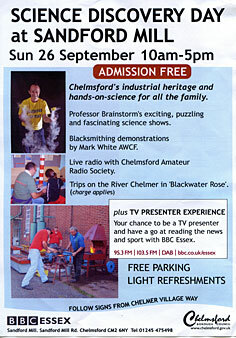 CARS was invited to provide an Amateur Radio Station on the 26th September 2010 to promote Science & Discovery Day by Chelmsford Borough Council. 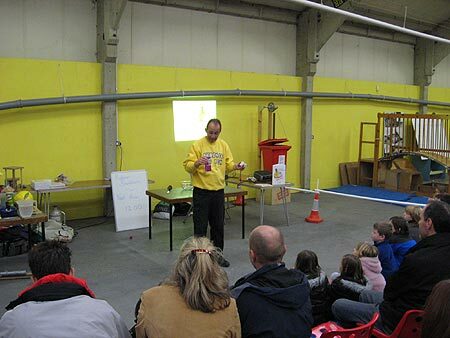 The day was forecast as being a cloudy day with rain later - this prevented people from going to the beach and over 750 attended this Science & Discovery Day - a pleasing number. In the morning, Dr Bowles and Friends of the Museum opened up the front office and showed off the newly aquired Wireless from Cornwall. A number of Members of the Radio Officers Association were in attendance including Brian Styles, Editor of their magazine. 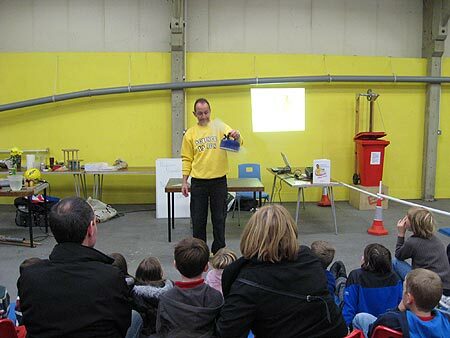 As an added attraction Professor Brainstorm had a number of sessions in the Barn. Also the working forge producing Horse Shoes was active. 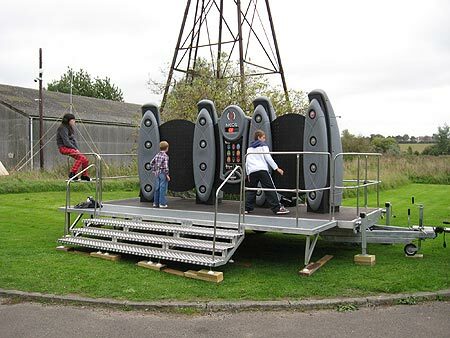 A large electronic slapping button quiz show was provided which ran off some of the excess energy on those aged under 10 as they "chased the flashing lights". 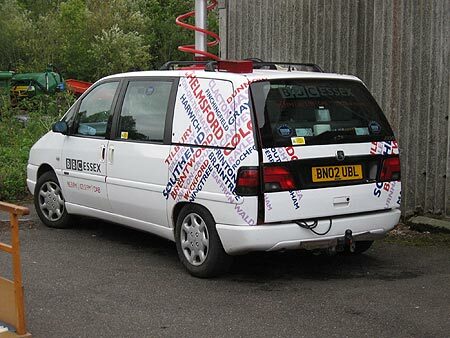 BBC Essex provided a TV Studio where anyone could read the News, Weather or even put on a short play. They were fully booked all day. 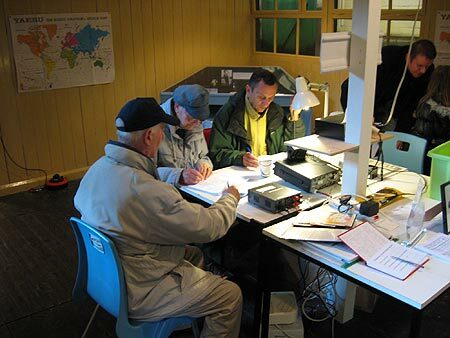 CARS provided our "usual" HF Radio Tx station in the Marconi Hut using our club call, GX0MWT. Mark & his Family provided a tent by the barn but unfortunately the nice blue CARS Banner was missing so we were a bit weak on saying who was in the tent - pity - the banner has now turned up. 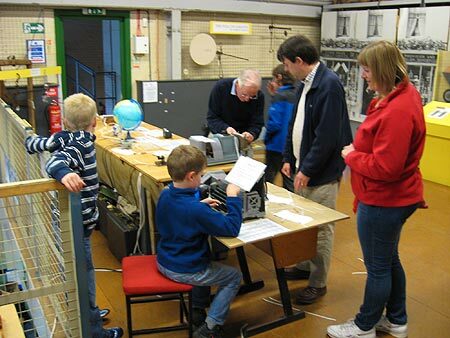 Colin, G0TRM, assisted by Peter, M0ZBU provided the now famous Mechanical Morse demonstration display on the staging. The HF band conditions were maybe a little better than last year - there was even reports of a new Sun Spot! 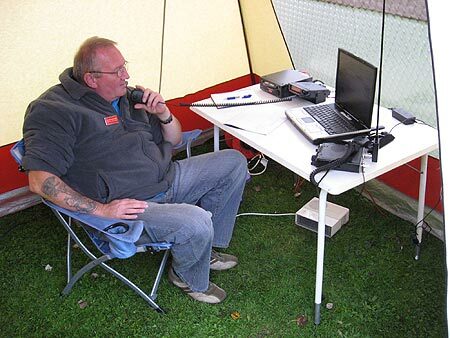 The operators worked a string of QSOs, all around the UK and Europe. 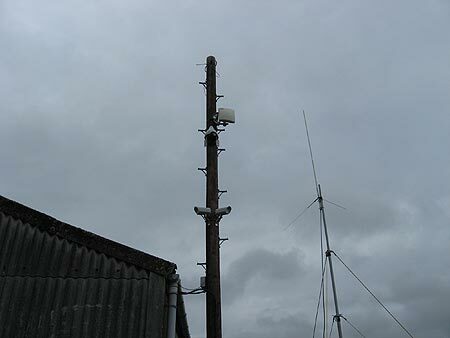 Unfortunately VHF/UHF proved very difficult - working down to the Thames seemed the best which could be acheived. More work is needed to improve this situation. CARS used the usual "Half-wave Doublet, centre fed Aerial on 80metres" over the water course which surrounds the Mill. 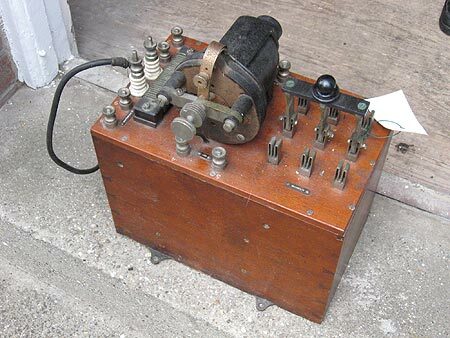 This contributes enormously to the strong signal which radiates from GX0MWT when using the FT847 Transceiver and 100 Watts. 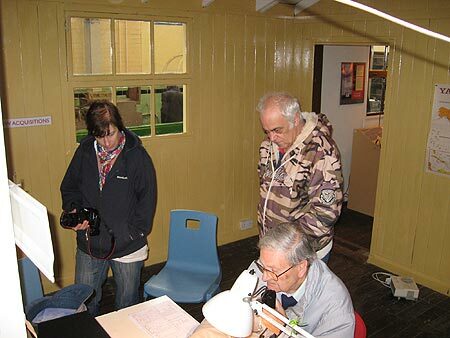 Visitors looking at Brian, G3CVI operating GX0MWT. 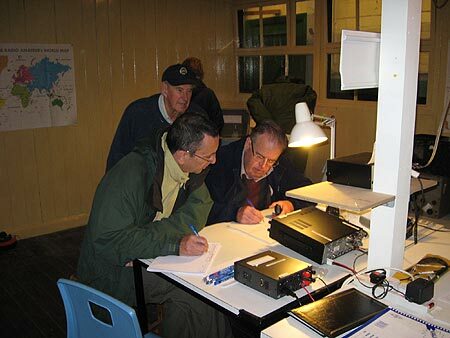 Patrick, M0XAP logging, Carl, G3PEM operating and Chairman John, G8DET Looking on. 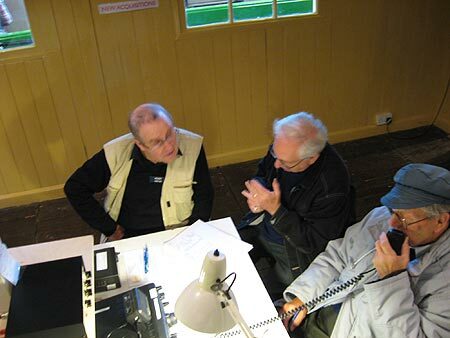 Clive, M0GHH looking on, Brian logging and Patrick operating. 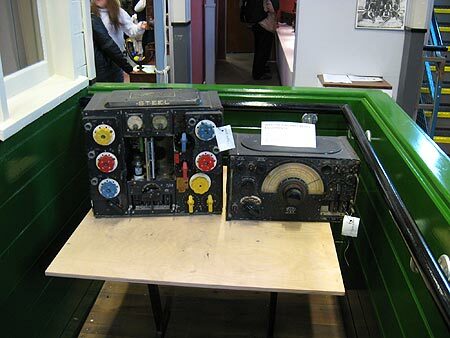 Looking at the Mechanical Morse table which is located on the platform. 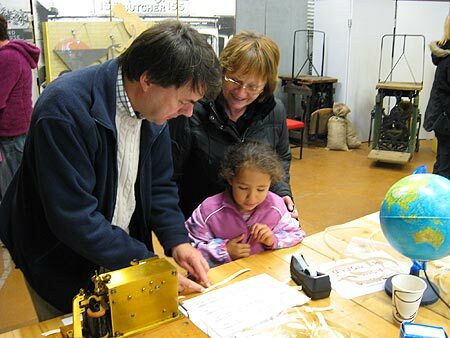 Alex is seated at the Tape Punch producing a Morse Tape while his Mother looks on. Reece is standing and looking bored behind. Peter, M0ZBU is looking at Colin. 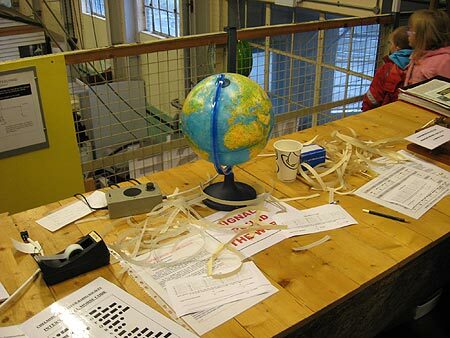 Having produced a paper tape it is fed into a Reader and the message is flashed via the globe to the Reader at the other end of the table. Peter showing Aleesha the characters on the tape which has just printed out her name. Kath is looking on and kindly gave permission for this nice photograph to be shown. 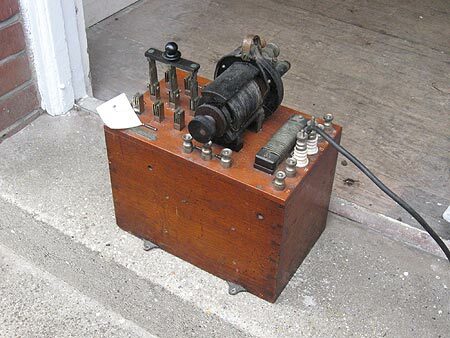 The Morse Writer (left) is at least 100 years old. 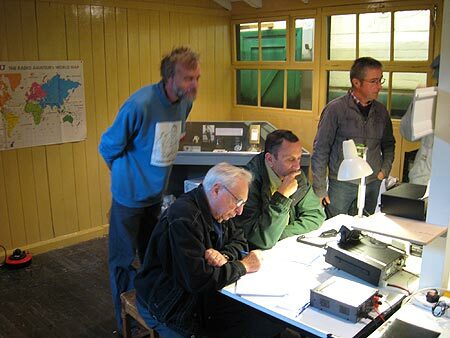 Malcolm logging, Patrick operating with the Keeper of the Museum, Dr G Bowles looking on. &Jim, 2E0RMI is talking to a visitor off camera. Brian, G3CVI logging with Malcolm operating GX0MWT. 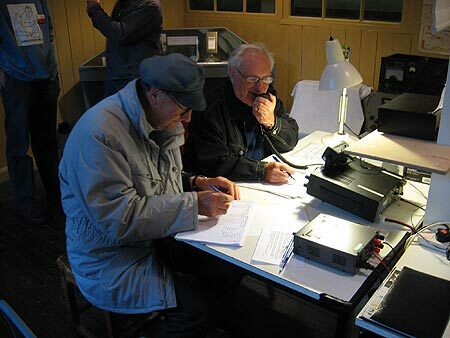 CARS Member Adrian Soane, M0ABY from Hertfordshire talking to Malcolm while Brian gets on with the QSO. The Marconi 1154 Transmitter with its Receiver, the 1155 outside the Marconi Hut. Thanks to all CARS Members who attended and made this Event the success it was. Thanks to Dr Bowles for inviting CARS and to all the Visitors who attended.